A man I know collects antique tools. He goes to estate sales and looks for calipers, wrenches, screwdrivers and whatever else, looking for exact makes and models from certain years, from up to the Great Depression. He cleans them but has no real interest in using the tools for their original purposes. Now, they’re art to him, a fun and relaxing hobby. Sometimes I think about the workers who had those tools. They moved on. They either quit using them or bought new tools that did the job better. They were no longer interested in using those particular tools or collecting them. The tools didn’t offer what they needed any longer. Are You Managing Your Projects with Old Tools? Managing projects is very similar. The features and workflows from 2002 are not built for today. Not with the rise of AI, machine learning, complex data science algorithms, cloud-based computing, APIs and sleeker programming languages. Those old tools won’t work for modern project management. You need tools that work for today. Which tools are cutting edge and actually offering something different in the marketplace? Throw away those big enterprise tools that everyone complains about, that only the project manager can use. Upgrade to these modern tools that you can use right away. What do the modern tools in this list include? 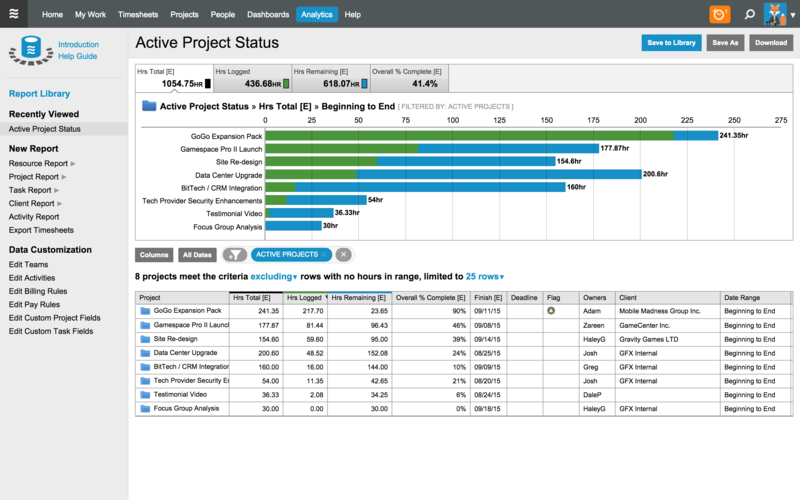 Cloud-based project management access: This is important for staying updated wherever you are. Board views: Most tools in this list feature a board view to help you quickly visualize what’s next. Team Collaboration: The best project management tools are for everyone in the organization to use, not only the administrator. Everyone should contribute, respond and assign tasks as needed. 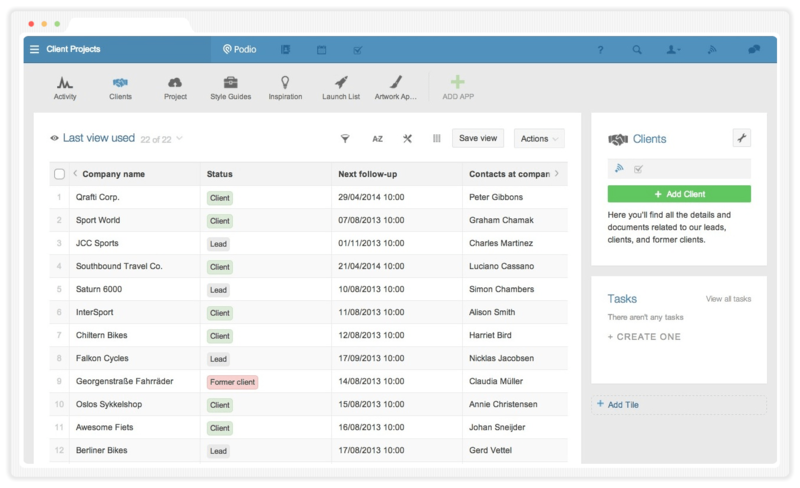 ClickUp has taken the project management software arena by storm! Our aggressive release schedule has delivered several “little big things” that users can’t live without— like a Notepad, dark mode, Chrome extension, global font support, email task management and more! But those are just the convenient features. ClickUp has important features that the savviest project managers need. Customized Views: Each team member, project manager or a user can include how they want to work. It’s that simple. Get a box, board, or list and create a saved filter to share with your team. This helps with agile project management, waterfall or a hybrid method. Priorities: Which tasks are most important? Set up custom priority levels and collaborate on task management based precisely on how vital each task is to the project! Drag and Drop: This is one of the key features, especially if you have multiple teams using spaces and projects in ClickUp. You can drag, drop, move, and re-assign tasks to people or teams in just a few steps. There are no annoying menus. You move the tasks to where they need to go, in any view. Assign Comments: Immediately assign comments as a subtask, and set up specific dates and times to follow up. Or convert it to a task. Gantt Charts: Visualize and connect your tasks in an amazing new way. ClickUp has one of the best Gantt chart features. Simple to use, easy to view. As one of the world’s largest project management software programs, teams use it to plan workflows, share files and collaborate on projects. 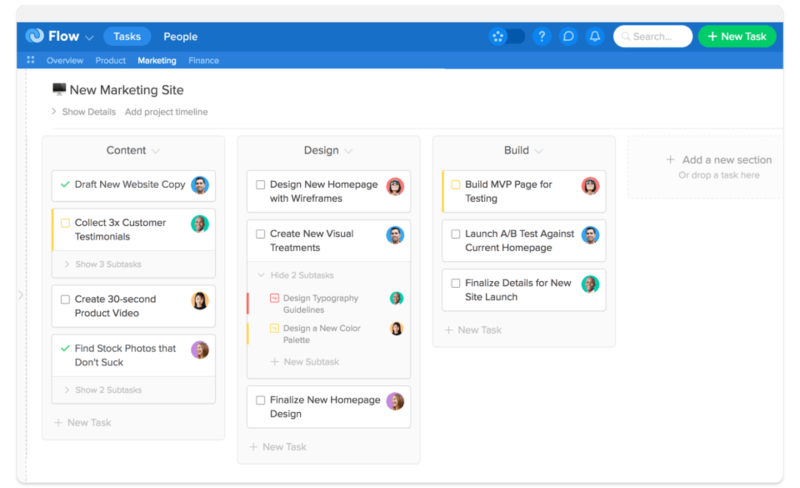 Founded by former Facebook execs, Asana emerged on the scene to deliver simple project management, especially when compared to big players like Microsoft Office. Their focus on usability has made them a standout player. 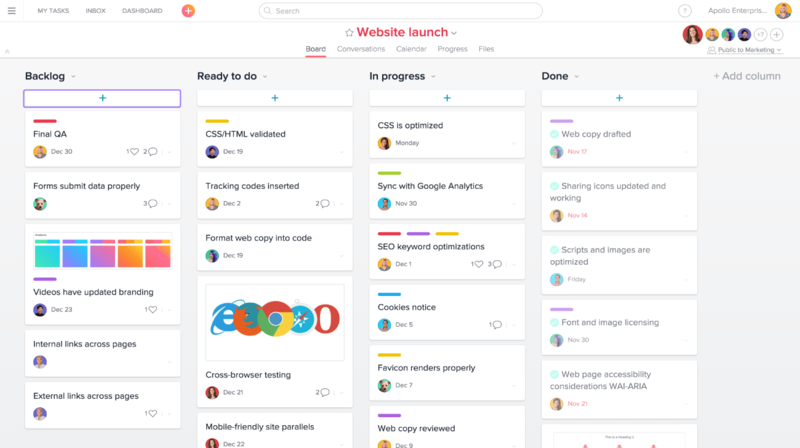 Asana is easy to use for small teams, and it’s a cinch to prioritize work or create a simple to-do list. It will be harder to use Asana as your team grows, as they don’t accommodate various views, (such as Kanban and List). You have to choose one or the other, which won’t work for teams trying to collaborate. Another big complaint? No multiple assignees. Often Asana doesn’t provide the flexibility to let you work the way you want to work. Go here to learn more about Asana and why you should consider ClickUp! If you’ve spent any time on Youtube in the last year, you’ve seen a Monday ad. Like. Every. Second. But just because they have a lot of bark doesn’t mean it bites. You have to ask: Is it the right project management tool for your team? 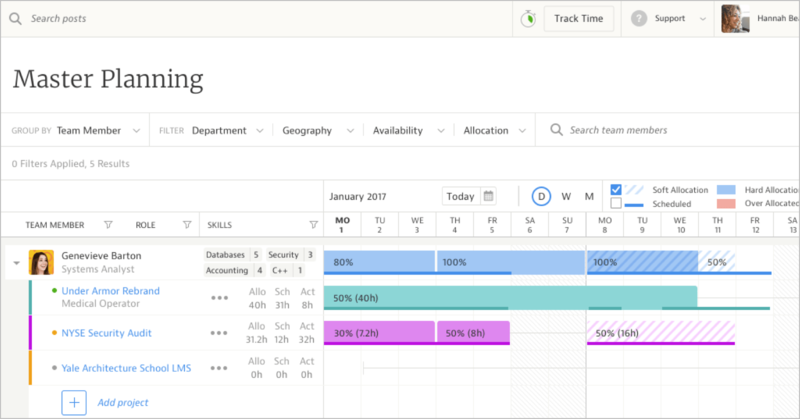 Monday is great at creating task lists and databases, but it loses some of its luster when it comes to the powerful and flexible features that your team needs: like native time tracking, recurring tasks, and start dates. Other options, like ClickUp, offer handy features that you didn’t even know you needed: like a task tray, notepad, and slash commands. 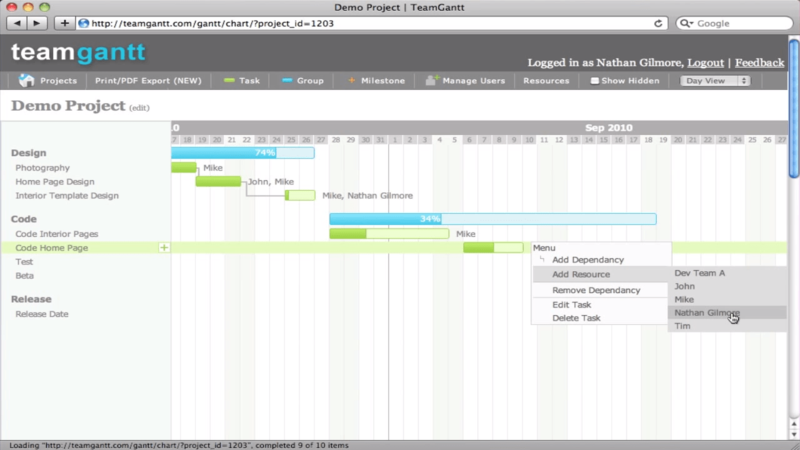 If resource planning is important for you, then TeamGantt is a reasonable choice. Built around the visual Gantt chart, you can move tasks along a timeline, set due dates and quickly add comments about due dates and more. It’s also easy to find how much capacity team members have to contribute and work on projects. We’re including Microsoft Planner here instead of Microsoft Project because honestly, MS Project isn’t a very modern tool. It’s the granddaddy of them all and that legacy has held it back. Microsoft Planner, on the other hand, is the tool that Microsoft hopes will carry its team collaboration suite for decades (?) to come. Much like Trello, it’s a card-based system that should provide some comfort to any teams that want to stick with the Microsoft Enterprise suite while getting another option beyond MS Project. Flow’s simple approach to task management makes it a safe choice for teams. Started as an in-house project in the earlier part of this decade, Flow has built a dedicated user base of freelancers and small teams, before branching out to enterprise clients. Its key ingredient is a timeline view or modern Gantt chart, which can be expanded to see project details, comments and more. Flow locks you into one view and doesn’t have custom fields like many of the other tools on this list. Unfortunately, JIRA has become the default for IT teams and programmers without a second thought. Big mistake! Even though it’s proven with issue tracking, agile project management and advanced reporting with burndown charts (and more), JIRA is one of the hardest project management tools to use. It’s essentially the new Microsoft Project for software dev teams. Hey, there’s a new JIRA, so maybe there’s hope? 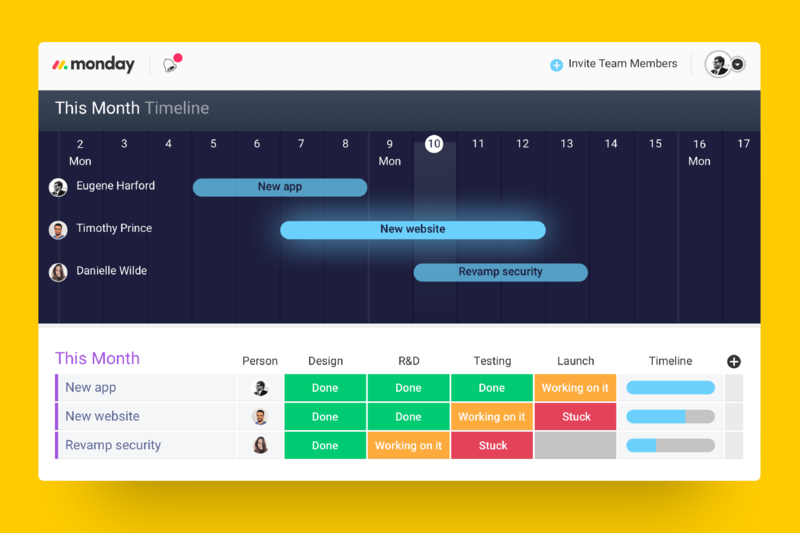 Or you can skip over JIRA and find a project management system that your team will look forward to using. 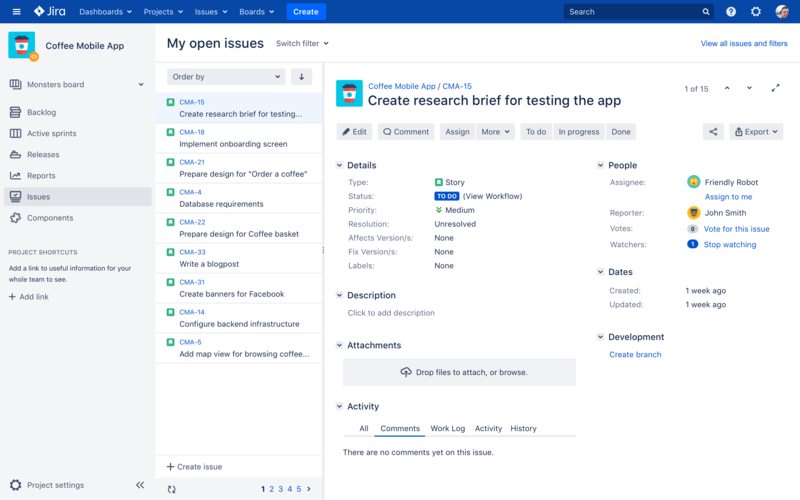 JIRA is trying to evolve as other project management tools change, but if you don’t want to wait that long…look for a JIRA alternative that will help your team get things done (rather than frustrate them). Users like Podio because of its customization. Users can name and customize their own features within Podio, and it connects to other Citrix products–such as GoToMeeting– creating a more seamless enterprise workflow. It looks and feels like contemporary social media tools, meaning its enhancements and features are comforting over cutting edge. However, Podio has been dinged for having a steep learning curve that may not be easy for teammates to pick up right away. Podio’s hierarchy is a strong point–with organizations, workspaces, projects and then tasks. Mavenlink provides repeatable project templates and project plans to help you replicate your most successful projects. Keep the task lists, checklists, schedules, budget estimates and assignments consistent. 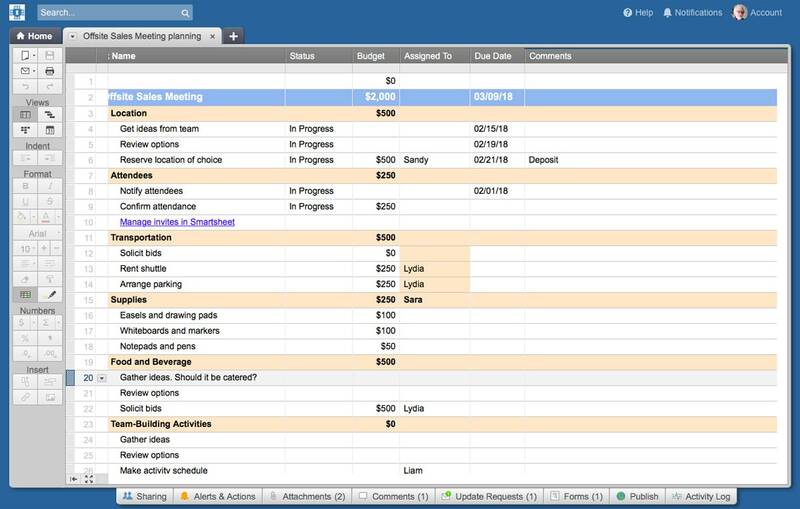 Smartsheet is for teams desiring powerful project management in a spreadsheet. If the love of your life is Excel, but you need something bigger, than Smartsheet is the project management tool for you. They’ve expanded into more enterprise-level features with wikis, ticketing, budgeting and more. If you need to get work finished in a hurry, LiquidPlanner makes time and estimates center stage so you’ll always see how far along a project and task is compared to your estimate. You can also view your team members and see how many unallocated hours they have for that week, helping you slot in the next tasks automatically. This isn’t Redbox, it’s Redbooth. Work is streamlined, tasks can easily be found, and its video chat feature brings details and communication together. 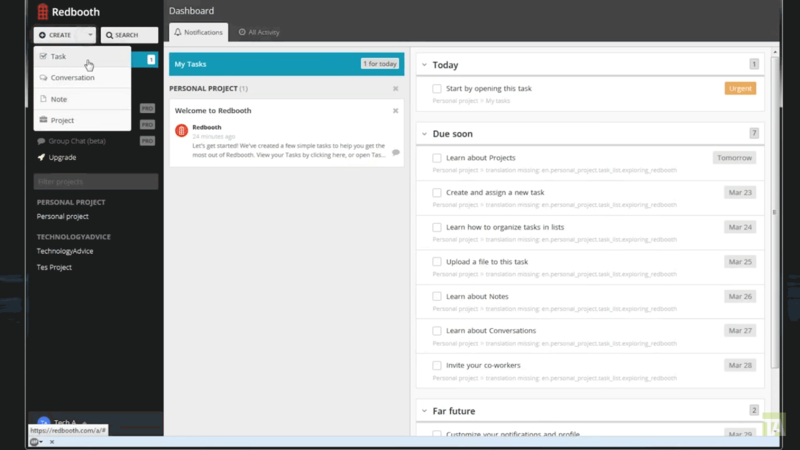 It also offers multiple views, such as a timeline, board, and list. Conclusion: Which Project Management Tool is Right For You? 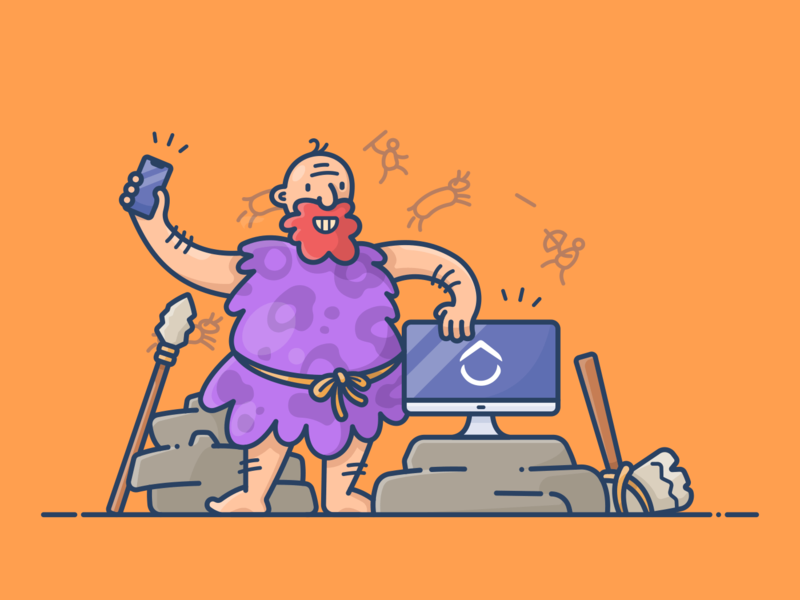 Project management tools aren’t antique tools. You need something to use now; not polish and put on the shelf. When you’re considering a new project management tool and productivity platform, it’s important to think about what your team needs now, not necessarily what you’ve used in the past. Your team is different, your needs are different and the technology has evolved. When making your choice, compare the prices with the features that are offered, and what features will actually help you. These extra features–like a Chrome extension, notepad or task tray–may not be on your wishlist, because you didn’t even know they existed. Those extras and little big things are what makes the hunt for a new project management tool exciting and fun.